Also known as computerized tomography, a CT scan is a special x-ray technique that generates images of internal structures of your body in cross section. This is different from conventional x-ray techniques that typically generate overlapping images. In conventional x-ray techniques, a stationary machine focuses radiation beams on a specific area of the body. This generates two-dimensional images, usually on a film or a digital detector, similar to photography. CT scans use a revolving x-ray machine that is connected to a powerful computer. When the CT scan unit rotates around your body, it generates cross-sectional images (like slices) of internal structures of your body. CT scans can be carried out even when you may have internal implants such as a pacemaker or an internal cardioverter defibrillator. You are pregnant: In this case, your doctor may recommend alternative techniques that will protect your fetus from potential risks of radiation exposure. You have allergies or asthma: If you have experienced adverse reactions to contrast media in the past or in case you have allergies or asthma, you will face an increased risk of getting adversely affected by the contrast medium. You have other ailments: If you have other diseases such as asthma, diabetes, certain thyroid conditions, kidney problems, or heart disease, the risk of an adverse reaction to contrast media will increase. The specific part of your body that is being targeted will determine your preparations for a CT scan. You may have to remove your clothing and put on a hospital gown. You will also be asked to remove any metallic items, for example jewelry, that can distort image results. In specific CT scan procedures, you may be required to drink a contrast media prior to scan or have it injected during the scan in one of the veins in your arm. A contrast medium shows up as white on output images since it blocks x-rays. This helps highlight the bowel, blood vessels or other internal structures. If your CT scan requires the use of a contrast medium, you may be asked not to eat a few hours prior to the scan. Depending on the specific part of the body being targeted, you may be asked to take enemas or suppositories, laxatives, or to change your diet temporarily. Although rare, there are certain risks of allergic reactions associated with the contrast medium used in a CT scan. For individuals with asthma, the allergic reaction, if any, can lead to an asthma attack. In some rare cases, an allergic reaction can be critical and potentially life-threatening. It may involve swelling of the throat or other parts of your body. You need to inform your doctor immediately in case you experience itchiness, hives or swelling in the throat during or after the CT scan test. If in the past you have been adversely affected by a contrast medium and you need to take a CT scan again that involves a contrast medium, you need to inform your doctor. Inform your doctor in case you have kidney related issues because it is your kidneys that remove the contrast medium injected through the vein. The contrast medium may inflict more damage to your kidneys. During a CT scan test, you will be asked to lie down on a table inside a round, doughnut-shaped machine known as a gantry. The machine has an x-ray tube that revolves around your body and emits radiation in small doses at varied angles. The gantry has detectors that record the amount of radiation exiting the body and converts the radiation levels into electrical signals. These signals go to a computer that assigns them different colors (in varying shades of black and white) depending on the intensity of the signal. Images are then processed, assembled and displayed on a computer screen. A CT scan test can be conducted in a hospital or in an outpatient setting. The test should not take more than one hour depending on the required preparations and the potential involvement of a contrast medium. In the newest machines, the test may not last more than a minute. Most CT scans take only a few minutes. 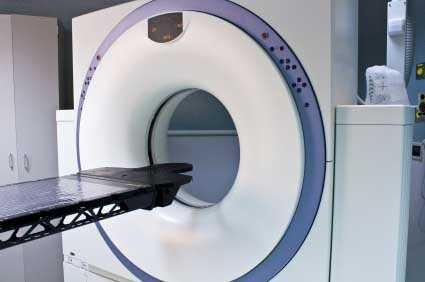 In a CT scan test, you lie down on a narrow table which slides inside the gantry through its opening. Depending on the specific area being targeted, you may be asked to lie down on your stomach, side or back. The table’s height can be adjusted. Pillows and straps can help you stay in the desired position. If your head section is being scanned, a special cradle can be fitted to keep your head still. With the rotation of the x-ray tube, the table gently slides through the gantry. To prevent blurring of images, you may have to hold your breath when the table is moving. You may hear whirring and clicking sounds. With each rotation, the x-ray machine generates several different cross-sectional images of your body’s internal structures. During a CT scan, a technologist operates from inside a shielded room to supervise the scan test and monitor images appearing on the computer monitor. The technologist can always hear and see you and you can communicate using the intercom. CT scan tests are painless. You may briefly feel a heat sensation or experience a metallic taste inside your mouth in cases when a contrast medium is injected intravenously. In cases when the contrast medium is administered through an enema to highlight your lower gastrointestinal area, you may experience a feeling of cramping or fullness. You can return to your normal routine once the CT scan test is over. If a contrast medium was involved, your doctor, the CT technician or a nurse may provide you special instructions. You may have to wait in the radiology for a brief period of time to ensure that you start feeling well again. You may also be told to drink plenty of fluids in order to make it easier for your kidneys to flush out the contrast medium from your body. Images produced by a CT scan machine are stored inside electronic media and generally reviewed on a computer. The images are evaluated by a radiologist who then sends a detailed report to your doctor.